Other people blogged about the conference, so I’ll be very dry and technical. I served as the accessibility coordinator of the conference. In addition to myself, I arranged for accessibility for two more people with disabilities – blind woman and a deaf+parapelgic man. I reached the trivial conclusion that it was much easier in previous years, when I needed to arrange for accessibility only for myself. Before the conference, it was suggested that we’ll try to arrange for lecture transcript straming to the Internet, to benefit people who cannot attend the event in person. I bought into the idea when I realized that it would make the lectures accessible to deaf-blind people, who bring with them laptops with a Braille display. Originally, I thought that I’ll not have the time to figure out the technical details. However, since I was laid off two weeks before the conference, I had ample time to deal with the challenge of lecture transcript streaming. During those two weeks, I went through the whole process of evaluating and selecting a transcript streaming method, and settled on IRC. Then, I evaluated few IRC clients, until xchat was chosen. Finally, I figured out how to configure the IRC channel to meet our needs. However, all those efforts came to naught because the wireless network at the conference blocked IRC and opening IRC had to be arranged ahead of time instead of at the last minute. Alternatively, I could have used a wireless modem, but I was not prepared for this. The chosen IRC client had the problem of wasting columns on uninformative nickname of the speaker on the channel being followed. For the next August Penguin, a special-purpose client should be developed. It will take care of all details of reserving a channel and it’ll allow text entry and display in an optimal way for the task (lecture transcribing and real-time streaming of the text). During the process, I got help from several people. A thank-you letter should be found in the archives of the discussions@hamakor.org.il mailing list. 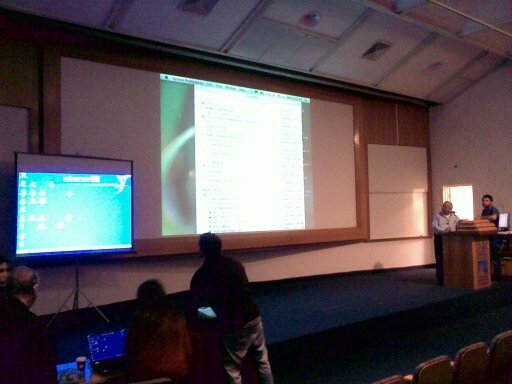 In addition to the IRC problem, the laptop got stuck once, losing the transcript of the quick lecture about Free Software in Education. The notetaker and the deafies sat near one of the lecture hall’s entrances, and it turned out to be a noisy place until the door was closed. As a result, the notetaker missed parts of what was being spoken in the lectures. As far as I am aware, everything else worked flawlessly. I brought with me a power splitter with three sockets. I was amused to notice that people with laptops, who sat near us, needed the electrical power to recharge their laptops. So all three sockets were in use.